My three words for 2015. What are yours? It has been a tradition at CPA Success to start the new year with three words to provide. I started this after finding Chris Brogan’s 3 Words tradition and hearing of Jeff DeCagna of Principled Innovation with his three words from 2009 – Serious, Simple, Social, which I borrowed (with permission) that year. I find these three words help provide focus throughout the new year, and I hope they will inpsire you to do some thinking for your three words for 2015. 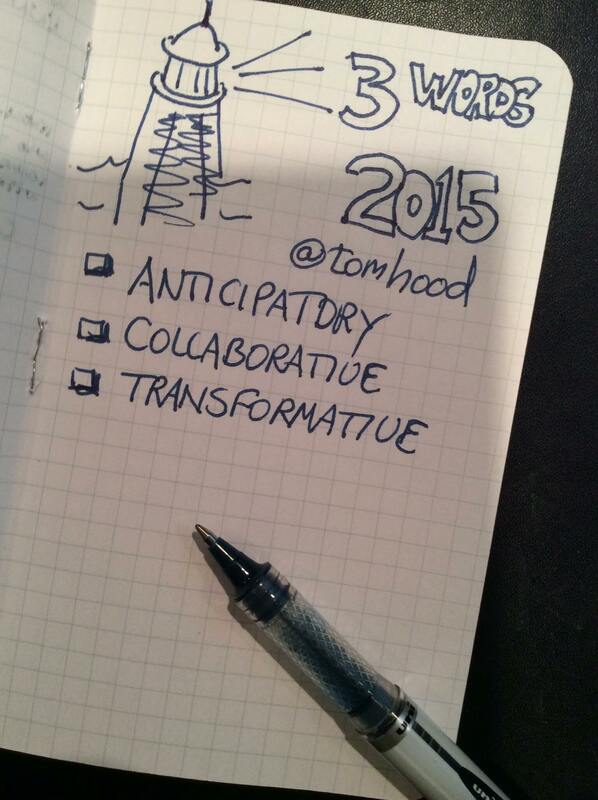 My three words for 2015 are Anticipatory, Collaborative, Transformative. Anticipatory: In this “fast future” of exponential change, being proactive is no longer enough. Proactive implies reacting faster to the changes coming at you. We saw this come up in our research with CPAs across Maryland and all over the country as they talked about the challenges of not having enough time and being reactive versus proactive. But we asked: Is there a better way? Another right answer? That is my goal for 2015 and for our organization – to become anticpatory. To learn the skills that will help us solve problems before they happen and move from crisis managers to opportunity managers. We have enlisted the help of leadng business thinker and futurist Dan Burrrus to help us. Look for more in 2015. Transformation: When Dan Burrus came to work with us in December, he said, “In the next five years we will transform − not change, but transform − how we sell, market, communicate, collaborate, innovate, train, and educate.” I believe we have moved beyond incremental change to a new era where we need to fundamentally redesign our businesses for this new social, connected, tech-enabled world. I believe that in order to help CPAs be future ready, I must start with myself and our organizations. 2015 will be the year we move farther along in the “Shift Change” and work to help our members and customers lead their own transformation efforts. These are my three. What are your three words for 2015? 2012: Connect, Focus, Smooth (I think I got “connect,” better at “focus,” and still working on “smooth”). 2011: Messy, Integrated, There is no manual (actually this is six and it was done after New Year’s Day). 2010: Serious, Simple, Social − borrowed with permission from our friend Jeff DeCagna of Principled Innovation. Please share yours in the comments below.